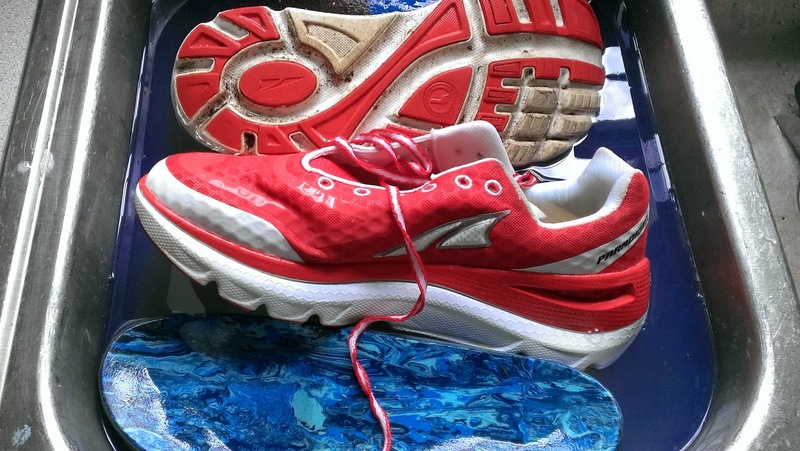 Do your running shoes need a room of their own after a few summer runs? Mine do. They don't stink like teenage locker room stench, from rampant athlete's feet, but they do get a sweaty smell that can be quite overwhelming, especially after having been left by "accident" in the car overnight. So, what's a runner to do? I know, every time I tell people I wash my running shoes I get all kinds of flack about how I'm ruining them. But, I don't really see how my run yesterday which left me squishing in my shoes from the sweat pouring down my body and into my shoes is any different from me rinsing them with clean salt free water. Or how is it any different from the tempo run I had last week when 3/4 of the run was during a monsoon during which I had to run through a foot of water because a street drain was clogged. Not really that much difference. Water is water. However, I am careful what I wash them in. I prefer something like Woolite. I also like detergents such as WIN and Sports Wash that are designed to get sports related odors out of clothing. 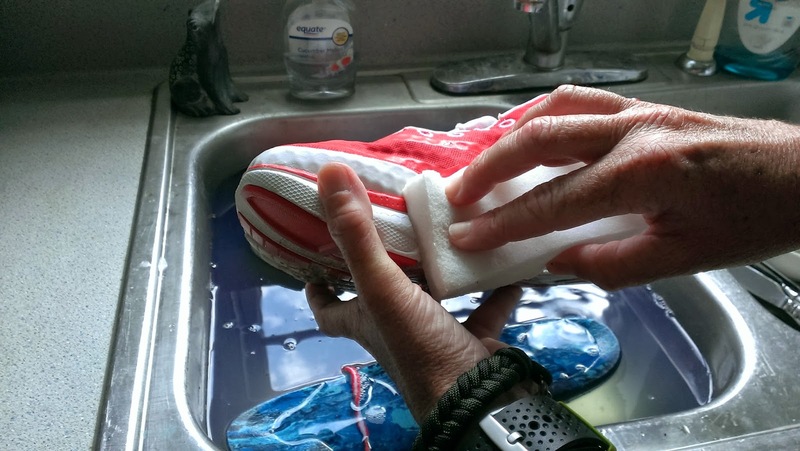 Sometimes, I'll put the shoes in the washer on the delicate cycle using only cold water, but normally I just fill a sink with cold water, put in some detergent, pull out the insoles and laces and soak everything for about 10 minutes. After soaking, gently rub the fabric to loosen any dirt still hanging on, then rinse them thoroughly with cold water and squeeze out any excess water. Be sure to thoroughly rinse the padded areas in the back of the shoe near the heel area. Detergent will often collect in the padding. Rinse until you no longer see any bubbles emerging from the padding. If your shoes have white soles, use a Magic Eraser cleaning sponge to get rid of those lingering stains and smudges. 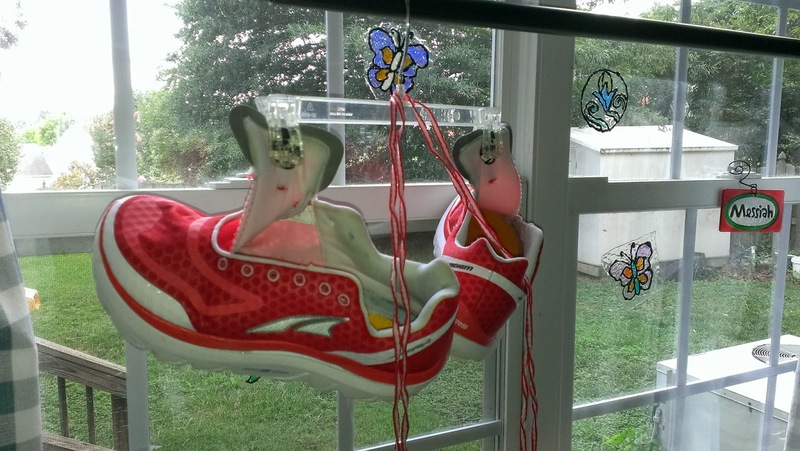 Next, clip the tongue of each shoe to a hanger, loop the laces around the hook and hang them to dry. Prop the insoles by an air vent to dry. NEVER, NEVER, NEVER PUT THE SHOES IN THE CLOTHES DRYER!!! Next day, I have clean, fresh smelling kicks for my next run. Interesting. I always put newspaper in my shoes after running in the rain. Neverthought of just hanging them out to dry! Good tips!